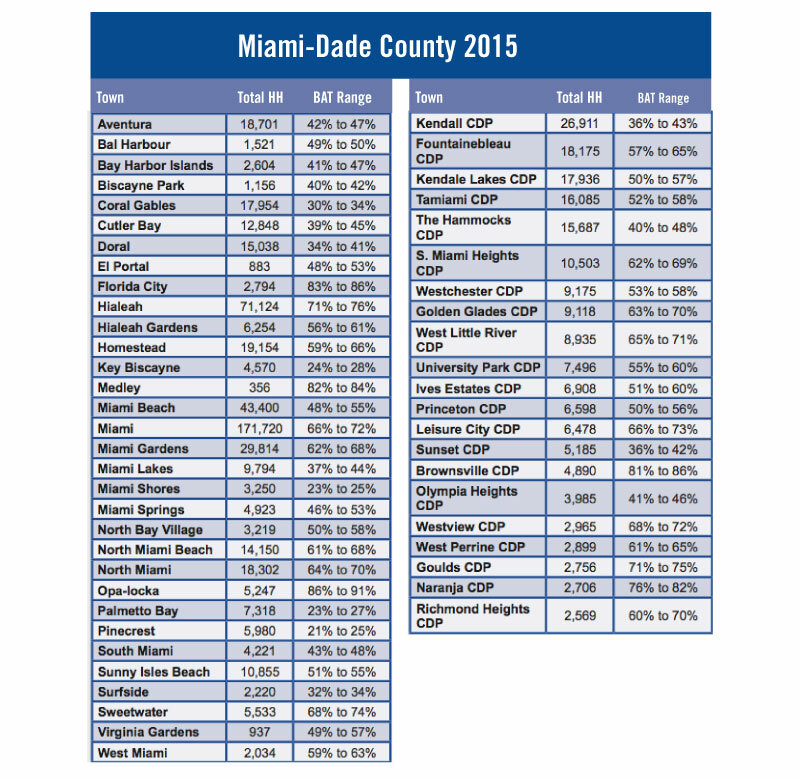 View and download the Miami-Dade ALICE Recap. View and download the ALICE Report. View and download the FL County Pages. It’s easy to be blind to someone’s financial struggle. You grab a cup of coffee at the local café or bakery and don’t know the barista is a college student or single mom holding down two jobs to make ends meet. ALICE families are our neighbors, friends and family members. The updated United Way ALICE Report is providing a holistic snapshot of financial insecurity at the state, county and municipal level. 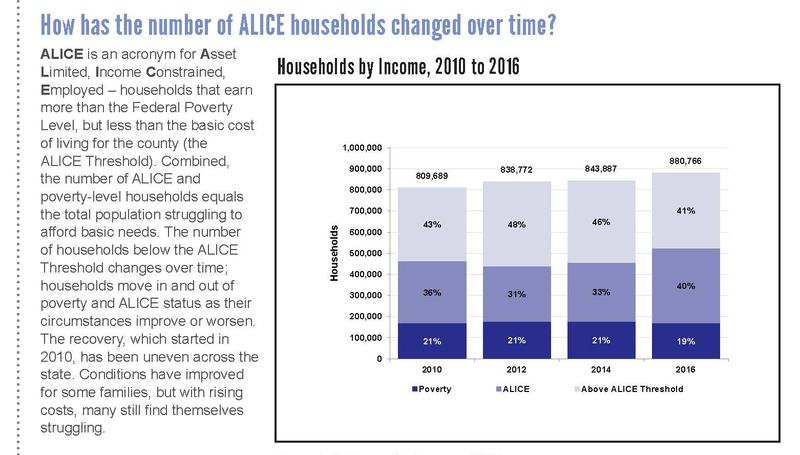 The population identified in the report as ALICE (Asset Limited, Income Constrained, Employed) are hardworking members of the community who are employed, yet can’t keep up with the rising cost of living. ALICE families earn above the Federal Poverty Level, yet struggle to cover basic needs, including: housing, child care, food, transportation, health care, and necessary technology. Traditional measures of poverty do not capture the magnitude of people who are struggling financially – and that’s where the ALICE Report steps in. The Miami-Dade ALICE population has grown by 3 percent since the last report, which used 2015 data, while poverty dropped 2 percent, and 1 percent of households that earned just above the ALICE Threshold fell below the threshold. The Report shows that 40 percent of Miami-Dade Households are ALICE and an additional 19 percent are in poverty. Overall, nearly six out of 10 households continue to struggle in Miami-Dade. The Household Survival Budget calculates the cost of housing, child care, food, transportation, health care and necessary technology at a bare-minimum “survival” level. It does not include any savings, leaving a household vulnerable to unexpected expenses. Yet, even this minimal budget was much higher than the adjusted Federal Poverty Level of $11,880 for a single adult and $24,300 for a family of four in 2016. What is United Way doing to help? United Way’s approach to helping ALICE families is both short-term and long-term. We recognize the only way to ensure that individuals are empowered to be successful in the future is to make sure they possess the skills and education to be financially resilient. Short-term solutions to rising food and housing costs are important stopgaps to help families overcome these hurdles and United Way directly and through its investments in community programs provides this assistance. We also recognize that families need to be resilient in the face of economic challenges and that requires both long-term as well as more intensive interventions. United Way works with local and national partners and other United Ways to advocate at the local, state and federal levels for policies that affect children and families. United Way Center for Financial Stability provides financial coaching, free tax preparation services, employment assistance, credit counseling and debt management, among other services. United Way is also partnering with financial institutions and local government through the Bank On Miami initiative to help people access banking products that will help build their financial capability. Through the FamilyWize partnerhsip, Miami-Dade residents have saved more than $14.5M on prescription medications. Since 2007, 170,500 people have benefited from this program. Three new United Way initiatives are also empowering ALICE families: Mission United, our program to assist veterans who are returning home; EDEN Place, a resource center for families powered by Overtown Youth Center; and United Way Youth Institute, a year-long program to empower youth. Investments in nearly 120 community programs at 63 local nonprofits in the areas of early and school age education, health and financial stability provide a wide range of services designed to empower individuals and families for future success. United Way Center for Excellence in Early Education is a national model for quality practices in early education. It contains both a demonstration school as well as community programming. United Way’s Early Head Start Child Care Partnership grant serves 520 children in low-income communities through the provision of high quality services and mentoring at centers and family day care homes throughout Miami-Dade. The goal: ensure all children have access to quality programs, so they can have the best possible start to school and life.